This article which first appeared in Metropolis magazine highlights do not miss spots in Tokyo for foodies. We are spoiled rotten here in Tokyo. The food-savvy consumers of Japan have raised the bar for the dining culture to a level found in only a few cities throughout the world. Here are my favorite parts of town when foraging for food in Tokyo. To really get a feel for what the city has to offer, the best place to start is, obviously, Tsukiji Market. The inner market will be moving to Toyosu in 2012, so come and see this historical area while you can. Avoid it on Sundays, when it’s closed, and refer to the calendar for other holidays. While most people go to get their sushi at the source, I am addicted to the anago tempura at Tenfusa—tender eel in a crispy tempura batter sprinkled with a sweet soy dressing over a bowl of steaming rice. If you are not a morning person or it’s a Sunday, head instead up to Ameyoko in Ueno. The narrow street bustles with energy, and stores are popping at the seams with goods spilling out onto the road and into neighboring stalls. Hawkers call out with their scratchy voices offering discounts to the housewives. While Ameyoko cannot be compared to Tsukiji, you will find seafood, fruit, vegetables and some imported goods. Come in the fall and see the coveted matsutake mushrooms, often from China, at discounted prices. Getting in gear for your kitchen? Kappabashi, between Asakusa and Ueno at Tawaramachi station, is best-known as a place to pick up plastic food. Once you find that perfect sushi keychain, though, wander the streets and go where the real finds are. Kappabashi is where chefs and restaurateurs go to set up shop. If knives are what you are after, make a beeline to Kiya in Nihonbashi. The shop has a fantastic selection of cutting utensils in a range of prices, as well as other kitchen gadgets. My favorite part of the food culture in Japan is depachika, the grand food floors in the basement of department stores. The newly revamped Isetan in Shinjuku sparkles and shines. Don’t miss the sandwiches at Alain Ducasse’s premiere boulangerie, Be, or the sweets at Pierre Herme, considered by many to be the top French patisserie. In the wine shop there is a sleek bar where you can select from a long list of toasty, smokey whiskeys. Or pick up a bento and a beer and take the elevators to the roof-top garden for an impromptu picnic away from the crowds of Shinjuku. 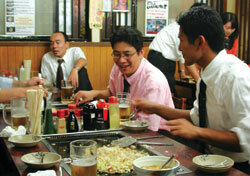 While Osaka may be famous for okonomiyaki, Tokyo has its own, much messier version, monjayaki. After getting out of the station at Tsukishima, follow your nose to “Monja Dori,” where it looks like time stopped about 25 years ago (left). The secret to enjoying monjayaki is to have your server help you make the first one or two until you get the hang of it. If you can manage to make it thin enough, you’ll find that the pari pari crispy bits put okonomiyaki to shame. Suggested toppings include cheese, mentaiko and mochi. Another area that smells so good it’ll have you jumping off of the train is Koreatown in Shin-Okubo. Come here for yakiniku, but if you like to cook at home, then make time to check out the local supermarkets, where you can find kimchi, pajong mix, and the finger-licking-good Korean nori. If you have time for a day trip, head south to Yokohama’s Chinatown for some great street food like steamed buns stuffed with chopped barbecue pork, sticky rice with chicken steamed in a bamboo leaf, and tapioca in coconut milk. While it lacks the energy you find in, say, New York’s Chinatown, and although there seems to be a curious lack of actual Chinese people, the area does not lack in restaurant options, and there are plenty of markets to pick up salt-laden stocks and dried scallops for soups. Another day trip that does not disappoint is to Utsunomiya. Actually, the city itself is a bit depressing, but the number of gyoza restaurants is tremendous. Go with a couple of friends and hit as many places as you can for pork-filled dumplings, fried or boiled. The urban adventure does not end here. Check out next week’s issue for Part Two of our Foodie’s Guide to Tokyo—with a look into various cuisine and specific shops to indulge in here in the metropolis. Check out next week’s Metropolis for the second and final installment of our Foodie’s Guide to Tokyo. For more information about Tsukiji market, see www.tsukiji-market.or.jp/tukiji_e.htm.